Regardless of the reclaimed material, electronics recyclers know one thing is unlikely to change about lithium-based batteries: When not handled correctly, this technology can be dangerous. In a way, lithium batteries are too energy-efficient to be completely safe; they pack a lot of voltage into a very small space, and when that energy escapes control, the results are searing heat and flames. It doesn't help that these batteries must use organic-based electrolyte, which is flammable by nature. 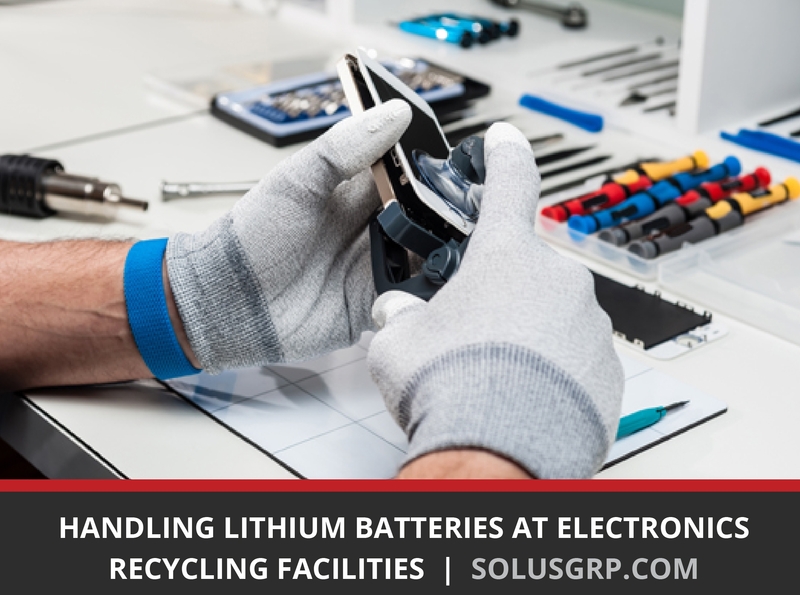 Luckily, electronics recyclers have developed best practices for handling lithium batteries. Before we get to those, though, it's important to recognize the difference between lithium battery technologies, and to measure the risk of handling each type within an electronics recycling facility. What Is a Lithium Battery, and Is It Different Than a Lithium-Ion Battery? Lithium-Ion batteries consist of high-capacity, rechargeable cells that create an electric current through a chemical reaction based on an ionic form of lithium. Electronics manufacturers use lithium-ion (sometimes abbreviated li-ion) to power cell phones, laptops, tablets, and other such small devices. Lithium Metal batteries, on the other hand, include solid lithium in the anode. Typically, these lithium batteries cannot be recharged; they're primary batteries, rather than secondary, rechargeable batteries like their li-ion counterparts. In addition to the chemistry that powers a battery, safe treatment can depend on the battery case. Sometimes these are cylindrical cells or other hard-shell cases, but lithium polymer batteries are popular for cell phones and other small electronics in which users prize lightness. These pouch batteries are easy to damage, especially when they enter the waste stream, and damaged lithium batteries create a serious fire risk. Just like traditional lead-acid batteries, these lithium-based technologies consist of an anode, a cathode, and an electrolyte. During discharge, lithium ions flow through the electrolyte, from the anode to the cathode. Ions move in the opposite direction as you charge the battery. Damaged batteries can short-circuit, translating energy into heat. This is called thermal runaway, and it's what causes most lithium battery fires. When enough heat builds up, the organic electrolyte in the battery combusts, leaping from intense heat into actual flames. If this occurs in a single battery cell, it can damage nearby cells within the module, which consists of multiple battery cells, and the pack, which is built of modules. It's easy to see how quickly the problem can compound, especially in a facility full of lithium batteries. Dropping batteries, leading to fall damage. Crushing batteries in compactors or while pushing them into piles with material handling equipment. Running over stray batteries with forklifts. Transporting heavier batteries along with lighter ones. Emptying containers of lithium batteries roughly. Puncturing batteries while attempting to remove them from devices. Fires caused by lithium batteries have been reported to burn between 400 and 1300 degrees Fahrenheit. If the batteries are contained or under pressure, they may explode. Now, it's likely that safer high-capacity batteries are on their way. Every manufacturer is working on solving the problem of safely containing high-density energy. In the meantime, though, electronics recyclers must be very careful when they handle these objects. Electronics recyclers overwhelmingly report the presence of lithium batteries in their facilities. In 2017, California's South Bayside Waste Management Authority partnered with sustainability consultants RRS to survey Material Recovery Facilities (MRFs, pronounced merfs) around the United States. Half of the respondents to that survey said fires were increasing at their MRFs. Sixty-four percent of respondents said they agreed that lithium-ion batteries are the most prevalent cause of MRF fires. An astounding 78 percent said these batteries were showing up in their facilities, and nearly 40 percent said they encountered li-ion batteries "a great deal." Provide tools and training to safely remove lithium batteries from electronic devices. Many lithium batteries enter the facility inside laptops and cell phones. Some of these may still carry a heavy charge, increasing the risk of a thermal event. The first step to safely bundling used lithium batteries for shipment to reclaimers is to carefully remove them from their devices. For many cell phones, this requires special tools: suction cups to remove glass screens, hot plates to melt the glue that holds the battery tight, and firm plastic scrapers to gently separate the battery from the case without puncturing or otherwise damaging it. Employees without proper training should not attempt to remove lithium batteries at all, and facilities that don't have the equipment to safely pull batteries from devices should never try to do so. Provide bulk material handling equipment that can transport batteries without subjecting them to crushing/impact damage. First things first: Never store or bundle lithium batteries until you've either individually bagged them, taped their contact points, or both. Exposed electrodes can form a circuit and self-discharge, leading to thermal runaway. Even after your batteries are taped and bagged, though, you still have to avoid impact damage. Use gentle material handling equipment like a Bin Tipper to transfer bulk quantities of sealed-off lithium batteries. With the addition of a tipping chute and the unique lift-and-tip motion, Bin Tippers can empty bulk loads smoothly to avoid damaging batteries. Prepare staff to respond to thermal runaway at every workstation. Even with preventative measures in place, damaged lithium batteries may enter a state of thermal runaway. That's why it's important to provide flame-proof, lidded fire buckets near every workstation that handles lithium batteries. Still, fire buckets aren't enough. Employees also need some way to move a burning lithium battery into the lidded container without risking a severe burn. The safest option is a long set of metal tongs. Once an employee has contained the burning battery, they should immediately remove it from the facility via the nearest fire exit. Handling the thermal event far away from other batteries — especially the damaged and deformed batteries found in every electronics recycling facility that handles li-ion — is much safer than trying to douse the flames in place. Staff must make every effort to isolate a single flare-up to prevent a devastating chain reaction. Clearly, used batteries are an important part of the recycling stream. Unfortunately, most municipalities can't simply instruct residents to throw their batteries into the single-stream, curbside collection system. The risks of damage are too great, and the costs of fire or explosion too high. That means residents must find organized collection sites that are equipped to safely take in batteries. In fact, MRFs and electronics recyclers themselves can be part of the solution. By working with local government and business partners, those in the recycling industry can help to set up safe, convenient collection points for old electronics and batteries. The easier it is to recycle batteries, the more materials there are to sell to reclaiming operations, and the fewer stray explosive items end up in the standard recycling stream. While no one can deny the challenges of handling lithium batteries at electronics recycling facilities, the fact remains that these power sources contain valuable materials, ripe for reclaiming. And until someone invents a completely safe lithium battery, the best ways to maintain safety at the electronics recycling facility are to prepare, train, and provide the right tools. Els, Frik. "Cobalt price bulls' worst fears may just have been confirmed." Mining. InfoMine, 4 Jan. 2018. Web. 19 Apr. 2018. "EPA Sustainable Materials Management Web Academy: Management Challenges for Lithium Batteries at Electronics Recyclers." EPA. United States Environmental Protection Agency, 5 Apr. 2018. Web. 5 Apr. 2018. Saefong, Myra and Sara Sjolin. "Nickel prices rally to more than 3-year high on growing concerns over U.S. sanctions on Russia." MarketWatch. MarketWatch, 19 Apr. 2018. Web. 19 Apr. 2019. "Strong Growth Ahead for Lithium Ion Battery Market." EPSNews. BBG Enterprises Inc., 6 July 2016. Web. 19 Apr. 2018. "Sustainable Materials Management (SMM) Web Academy Webinar: An Introduction to Lithium Batteries and the Challenges that they Post to the Waste and Recycling Industry." EPA. U.S. Environmental Protection Agency, 22 Mar. 2018. Web. 18 May 2018.